STUDIO 515 – CITY PLACE RESIDENCES (DOWNTOWN JACKSONVILLE) IS AVAILABLE FOR RENT BY THE OWNERS. CONTACT ME VIA GMAIL FOR DETAILS IF YOU’RE INTERESTED. CLICK LINK BELOW TO SEE PHOTO IMAGES OF A GREAT PLACE TO LIVE! “What a woman needs to write is a room of her own…” Virginia Woolfe. Good ‘0le prophetic Virginia. How I thank thee for uttering universal truth. Who knew there were thousands of happy residents dwelling in windowed towers that almost kiss sky along the river bank? Not I. Who knew my own building bearing the moniker “Residences at City Place,” served as a free-man’s holding cell to city employees, techies, policemen, artists, and a motley crew of others who I have no clue as to what they employment do. We mock the majors with our furry, leashed friends, monthly parking dues, front lobby banter, and late night, greased-box, deliveries. With one eye-closed, yes: this could be Atlanta, San Fran, or Manhattan, with a very off, off, off-Broadway kind of spin. But I like it. It’s quiet, quaint, and convenient. The building is kept immaculately clean thanks to the two, merciless hands of a lone Mexican woman who prides herself on finding crumbs in corners and smeared glass. There are three (working) elevators that open with precision and the laundry room isn’t a coin eating culprit. I like it. It’s home. There’s “Justin’s Restaurant” through an adjoining inside door or street entry that specializes in Caribbean, Seafood, and Soul Food. I testify that the plantains are sweet and the rice and peas are cooked “coconut milk drunk” until they reach moist consistency. Owner Michael Vann won my morning heart with his “cooked to order” veggie omelets and a phone call when ready. “Can your Broadway do that?” I don’t think so. OK. So one of the cities homeless missions is two blocks west, The rescue mission east, and the Salvation Army due north. A thick swallow if you’re a condo Realtor, but ya know what? I’m Clara White friendly. Over a decade ago, I parallel parked in front of her doors to attend Board Meetings. Am I too good to now neighbor? I think not. Besides, homeless people aren’t dangerous, they’re homeless and hungry. ‘Nuf said. Pleasing to the eye is my fifth floor view that reminds me daily that despite proximity setbacks, a six-block squared walk starting south on Ashley sends me in the direction of Art: MOCA, our modern museum, and her Louisiana cuisine girlfriend NOLA are a fresh air of pride. The new, improved, sprawling public Library cuts off the corner and then meets Chamblains Book Mine, the new gathering magnet, and home to the world’s best African Peanut Soup. Indochine Thai, The Next Gallery, and Zodiac Grill claim stake, as well as a righteous row of independent artists sharing – space, light, walls, and laughs – on Forsyth Street. Before reaching the St. John’s river, the annually resuscitated Jacksonville Landing sits and our lovely, dedicated symphony hall venue: The Times Union Center for Performing Arts. Ok. Your Broadway can beat that, but we can park for less than $50 to see an Artist Series show. Heck, I can walk for free! Point is, I like my new digs. I am a downtown dweller, and don’t need to be reminded that I must drive yonder across bridges to over-populated, retail saturated, zoned neighborhoods to shop for my organic palette. I am content waking up each morning and gently rolling open rows of vertical blinds lining my Studio’s broad, horizontal window. Grinning at me daily are my two, tall, skinny friends: Wachovia and at &t shining those dimmed lit, lowercase alphas. Of course that’s not representative of the skyline our emerging metropolis boasts, but my unit owns a few view obstructions that matter me not. I like it. 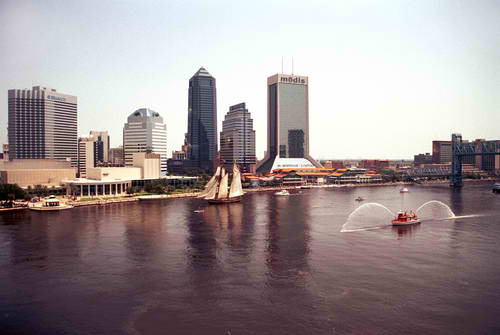 Downtown Jacksonville is all that it is, not quite all that I need it to be, and everything local politicians condemn. Don’t limit your visits to parades, festivals, JEA battles, and court appearances, and until you’ve called it home, be hesitant to deem it domicile hell to be amongst those who consciously choose to downtown dwell. I like it. And…the new courthouse (aka “The Parthenon”) is one block south. Very impressive P. You never cease to amaze me with your gifts and talents. Like a very wise person once told me…Stay the course! Doing me Mia V like a “poetic do-be.” Thanks!